I have always loved red and aqua together. They make such a classy color pair. When creating a new printable party line for Christmas this year, I decided on going with this color duo to vear from the traditional red and green. Earlier this week, Amy Atlas featured Mon Tresor's Christmas Table with her use of the red and aqua color scheme. It is truely a lovely display with simple and sweet touches. 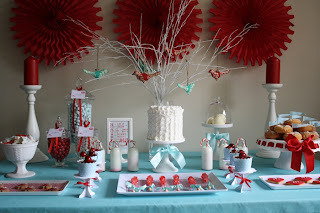 I was beyond thrilled that Mon Tresor has used my Peppermint Printables to use on her table. The hanging red paper fans really add a powerful burst of color for the backdrop. White platters and plates are essential for any dessert table but you can really dress them up using scrapbook paper as plate liners. This works well if you just have a few items on your plate that don't have a lot of color to them. 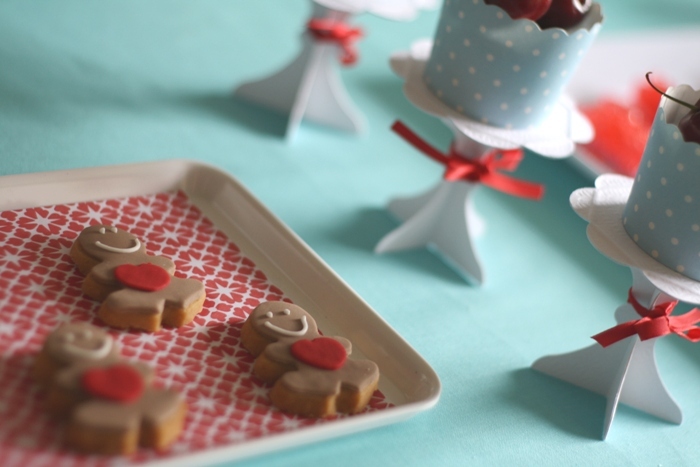 I love how she incorporated this idea with the little gingerbread cookies. 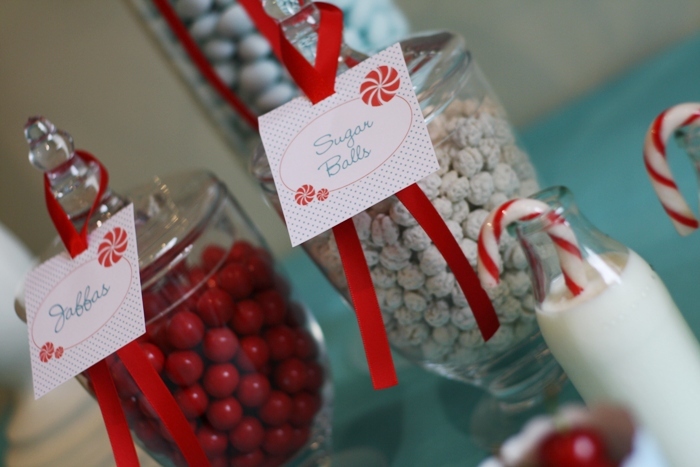 And of course, the candy tags are a delightful touch to any dessert spread. These are beautiful! 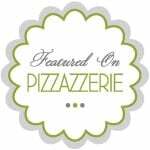 I found you through Lilac City Momma's blog and am following your blog now! I would love to have you follow me back! Found you via Glorious Treats on FB...I am so impressed with your work! Do you have a FB page also? I'd love to "like" you LOL! Here is to a glorious new year where all our dreams and ambitions come true. But lets not forget that it is us who have to make them happen. May this year be a turning point in our lives.